when you laugh and cry with their laughter and tears, you will know you are on the right track." Specializing in portrait sessions celebrating milestone anniversaries and special occasions. These portrait sessions are about commemorating a relationship and looking forward to more cherished moments together. If the last time you were photographed together was on your wedding day, then make an appointment now! When you are traveling with your family to Paris their is always someone left out of all the fun family photos. A photography session during your visit is a great way to capture your entire family together enjoying Paris and making new memories. *Rates are quoted for families of up to 4 people, 85euros each additional person. Great for a sweet sixteen, birthday or just because. Leave the excuses, self-consciousness and guilt at the door. These sessions are for a day of glamour and fun, make it extra special by adding hair and make-up styling and go from photoshoot to a night out on the town! We know you are short on time in Paris, and every moment spent on your portrait session is something you're not doing in Paris. Fortunatly we've set up 2 location choices that not only offers you the best places to be photographed but let's you see the sights as well. Talk about a time saver! 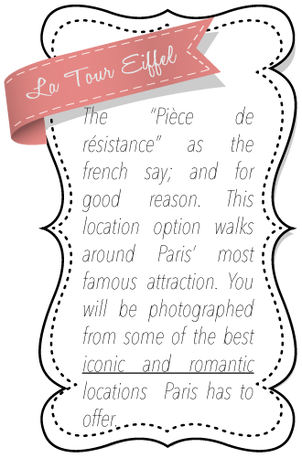 See Paris and all she has to offer while having your portraits taken, our location options start and end in the heart of Paris so after your session you can be on to you next attraction, on-time without skipping a beat! Online for 3 days, after image delivery. ​Your choice of La Tour Eiffel or Notre Dame Cathedral route. 1.5 hours of photography time. Online for 7 days, after image delivery. 3 hours of photography time. Your choice of La Tour Eiffel or Highlights of Paris route. 5 hours of photography time. La Tour Eiffel & Highlights of Paris routes. 8 hours of photography time, split into 2 days. Online for 30 days, after image delivery. Up to 3 outfit changes. ​La Tour Eiffel & Highlights of Paris or custom route. Custom ordering gallery with the best images from your session artistically edited and color corrected. Best images from your session receive extended retouching. Both candid and posed pictures. Need a photographer for an event in Paris? Click here.